not only physicist wannabes, but general astronomy enthusiasts also. The first dealt with the dynamics of planets, stars and black holes. The professor from UCLA described some of the latest analysis based on the simple recognition that many stellar systems were composed not of a single star, but often made of two or three stars all orbiting under the gravitational influence of each other. These "triple" systems can typically be analyzed as one closely bound binary star system and the other star, still gravitationally bound, but in a somewhat larger orbit. The total angular momentum of the system is composed of the angular momentum vector for the binary system and the other single star. The angular momentum of the total system is constant and conserved, even though the angular movement of the two subsystems individually varies and momentum exchanges between the two subsystems happens quite often as the various orbits sometimes just happen to pass closer than usual and the orbits get disturbed more than normal. Now this is where the latest simulations show that these chance events can be responsible for causing some paradoxes currently being observed. First, these systems are found to be able to disturb the orbits of any planets orbiting the stars and can cause migration of large "Jupiter sized planets" to migrate in closer to their parent star. Secondly, the simulations show that the transfer of moment time between the two subsystems can be responsible for large amounts of ordinary and dark matter to lose angular momentum and migrate and merge with the main star in the system. If this simulation study is verified it can provide an explanation for the migration of hot Jupiters and the formation of large black holes. It will be neat if this can indeed solve these long standing problems. The second colloquium by a UCI professor described the latest findings from the Fermi LAT orbiting observatory and how data analysis from gamma ray observations is being used in the search for dark matter. The gravitational effects of dark matter is a key factor in explaining the rotation curves of galaxies, the amount of observed gravitational lensing and the large scale structure of galaxy clusters. But, even given these successes, no direct evidence for dark matter has been observed and the search for gamma rays thought to be produced by dark matter particles that collide and annihilate. The problem is seeing this gamma ray signal that is buried in the noise of all the other natural gamma ray sources. Fortunately there are some observable differences between all of these sources. The Fermi observations used in this analysis are taken from views of the galactic center and from dwarf spheroidal galaxies (DSG). The galactic center is supposed to be where annihilation of dark matter and associated gamma rays are most likely to be found. But looking at the galactic center also is contaminated by other natural astrophysical sources of gamma rays that have nothing to do with dark matter. The presentation went over all of the gory details that limit making good observations of gamma rays from the galactic center. Because of this the search for gamma rays from DSG is thought to be easier. Unfortunately the observation of DSW does not support many of the dark matter gamma ray models. More effort is ongoing in both of these studies, especially in modeling and removing the natural sources of gamma rays from the galactic center. Now, back to the amateur observation of moons of Jupiter. My plan was to use just my camera and tripod as a simple setup. The Astro images were taken with 300 mm telephoto. Picking the right exposure setting was tricky because Jupiter is so bright that you don't want to get a big blob of light surrounding Jupiter, but you need enough exposure to capture the dimmer moons and oftentimes the even dimmer background stars. Sometimes I find that I need three different exposure settings to meet the needs of getting a non-saturated image of Jupiter while also getting the moons and the background stars. For instance, note how the image of Jupiter is just a white blob of light and no band structure on the planet is visible because more light is required to be able to measure positions. 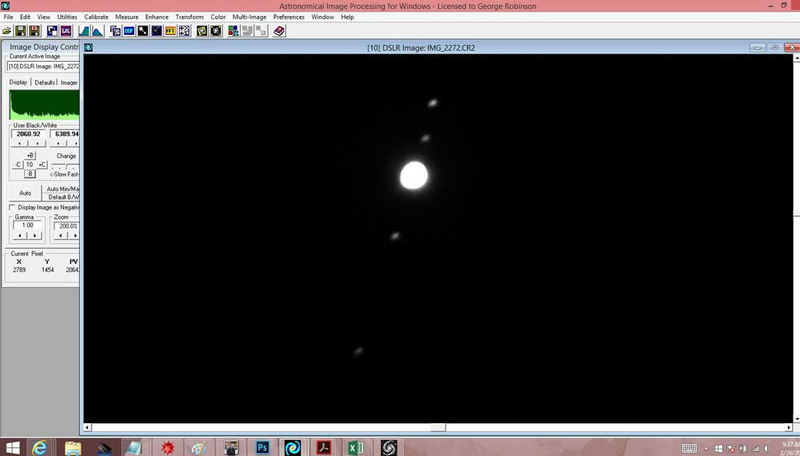 The first image shows Jupiter with four of the Galilean moons visible. The four visible object are assigned names and labeled, starting from the bottom of the image, T1 through T4, since I have no solid idea which of the named moons I am actually seeing. My plan was to take multiple images, like one hour a part for instance, in order to monitor the orbits of the moons. Then we should be in a position to identify which of the objects was in the closest orbit and which was in the furthest orbit. But, sorry to say, I got tired and missed taking any other images that night. I did try to make up for my tiredness the next day by performing some astrometric analysis of the image. 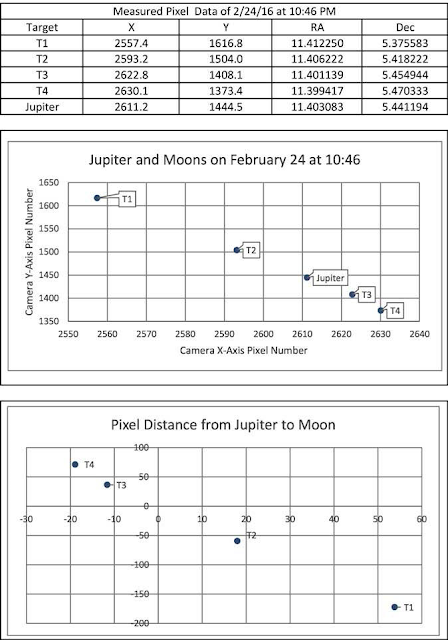 By comparing the background stars visible around Jupiter with the star catalog, the exact positions of the moons can be experimentally measured. 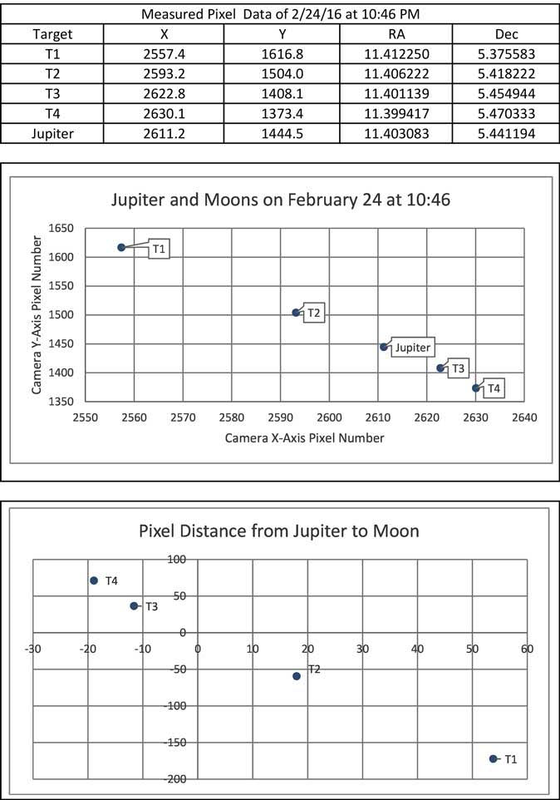 See the 2nd attached photo which shows a spreadsheet summary of the raw data, extracted from the camera image, and used to calculate the right ascension and declination for the visible moons. The analysis software, surprisingly, can achieve sub pixel resolution of the moons positions in the camera and can be used to calculate the angular separation between objects in the image. Note with just this one image we have no idea which way the moons are moving in their orbits about Jupiter. 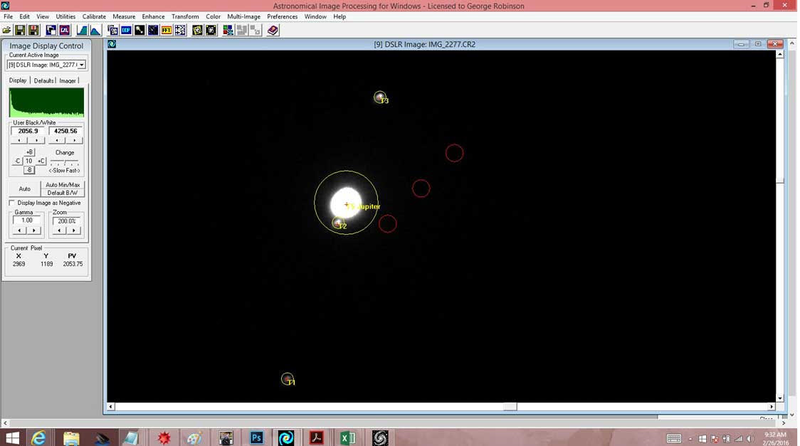 Multiple images are needed to track the moons about the planet. But I was tired and didn't get the shots. I finally did manage though to get one more shot in the next day, 24 hours later. The third attached photo shows the condition 24 hours after the first photo and note that now only three moons are present. Where did the third moon go? Apparently, it is behind Jupiter and not visible. I assume the missing moon is labeled T3 in the first attachment. Now look at the fourth attachment which shows the spreadsheet summary of the angular distance traveled by the moon over the 24 hour period. 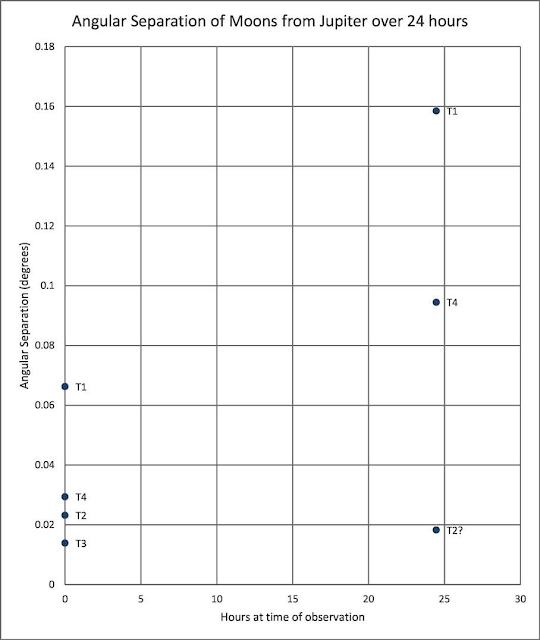 Notice that T1 and T4 are seen still moving further away from Jupiter since their angular distance to Jupiter has increased. Note how the object T2 appears to have moved to Jupiter. So what is the lesson learned after this observing and analysis session? Well, we have seen it is possible to extract real positions and location data from an image taken with just a camera, whose exact pointing angles are not known nor needed because we can rely on star catalogs and software to find the exact position. Also, if the amateur doesn't get tired after taking just one photo, then the moons motions could be more easily followed. In fact it is possible for the amateur to measure the path of the moons and go through the exercise of calculating the period, semi major axis and mass of Jupiter and other Keplerian elements of the orbit, just like the early pioneers like Kepler did so many years ago. So, my lesson learned this week is that I'm developing the capability of duplicating the observational determination of the moons orbits, I just need to be able to stay up all night, which seems to becoming my major obstacle. Now you know why I'm pursuing this self tracking tripod for my camera so that the whole collection of a nights worth of images can be done automatically. I'm also learning that the amount of time going into preparation and data analysis is now longer than the time spent on taking the observations. I've learned many times now that when something like the required exposure is not planned correctly, I end up with images that are not right and that set of observations needs to be repeated again. 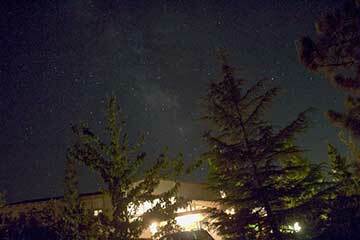 How's your nighttime observing going? Are we having fun yet?